In 1824, bones discovered in England were identified as coming from the first dinosaur to be given a name – megalosaurus. Thousands more discoveries since then have led us on a fascinating journey. Every new discovery has brought a deeper understanding and changed the way we visualise each species and its lifestyle. This major new book looks at the earliest scrappy finds and best guesses of the early 1800s through to the spectacular key discoveries that changed people’s minds and brought dinosaurs alive in the public consciousness. 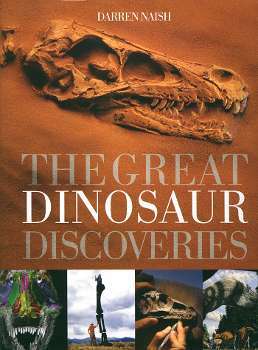 Key finds for each century are examined in chronological order, with information about the dinosaurs themselves interwoven with accounts of their actual discovery and the extraordinary scientist and explorers who found them. On this fascinating journey, we come back to the same sorts of dinosaurs more than once as new discoveries changed ideas on their appearance, biology or behaviour. The amazing new discoveries in China and South America in the last few years are fully documented, as are the major new finds of the 21st century. Darren Naish is one the most informed vertebrate palaeontogists of his era. He is totally dedicated to getting things right and his new book on The Great Dinosaur Discoveries is an example of his detailed approach to his work. He is a real enthusiast and spends as much time as he can, with limited resources, trying to find new dinosaurs in different parts of the World. The Dinosaur Society thoroughly recommends his new book to readers of all ages.